PART III. THE PENTAGRAM THE PENTAGRAM—SYMBOLS AND MEANING The Pentagram as a figure of sacred geometry, a five-pointed star, dates back to antiquity.The spiritual Teacher Beinsa Duno—Petar Danov gave it in its higher form at the beginning of the 19th century, at the threshold of the approaching New Age of Aquarius, the New Era of Light. At the spiritual gatherings (1910-1922), in the town of Veliko Tarnovo28 Beinsa Duno gradually presented the new image of the Pentagram and explained some of its component symbols. At the gathering in 1911, next to the portrait of Christ, a new drawing was hung—the graphic black and white representation of the Pentagram in its new form.The Master clarified some of the symbols shown on it for the first time. At the spiritual gathering in 1914 Beinsa Duno gave some more detailed explanations about the hidden meaning of the Pentagram and its correct use. In 1922 a new, bigger (180x140 cm) color Pentagram was placed in the prayer room of the building, where the spiritual gatherings in Veliko Tarnovo were taking place. It was an inspired work of art created by the Czech artist Franz Schlambora at the Master’s special request and directions. What is the Pentagram in its spiritual interpretation? It is a symbolic presentation of the Way to living a meaningful life—the Path of the spiritual student. It gives the five Great Principles inscribed inside the five rays of the Pentagram: Love, Wisdom, Truth, Justice, and Virtue. Each Principle has a corresponding color: pink for Love, yellow for Wisdom, blue for Truth, green for Justice, and orange for Virtue. These are expressed in human evolution as the five qualities of perfection which one needs to develop in order to become complete. When we take a close look at the Pentagram we can see that it corresponds to the human body. In fact, the Pentagram resembles a human figure with open arms and legs. Thus positioned—with the central ray pointing upward, the spread arms indicate that the person is moving, in other words, the Pentagram is a symbol of the human being in motion, in evolution. It also indicates the harmonious distribution of all intelligent forces acting in the awakened human being—this is someone who works for the Whole and serves God. The affirmation: In the fulfillment of the Will of God lies the power of the human soul, is inscribed in the circle surrounding the five-pointed star. 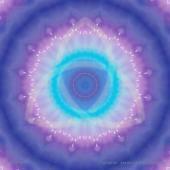 As a form of sacred geometry, the circle symbolizes favorable Divine conditions for manifestation. Therefore, it is a symbolic presentation of the Divine in which we live; thanks to the Divine we all have life and favorable conditions to develop and achieve perfection. “Immersed in God”—that is the sacred meaning of the circle. If we look closer at the words inscribed inside the Rays of the Pentagram: Love, Wisdom, Truth, Justice, and Virtue, the meaning of Love, Wisdom, and Truth is clear, but what can we say about Justice and Virtue? Justice or Equality has a deeper meaning than its present interpretation in the modern science of law. Justice is manifested by the respect and honor we should have for all that is living in the world: the ox, sheep, spider; the small flies, and the blades of grass—as God lives in all of them, there is a Divine Plan for their future. So, by insulting animals we are violating the Law of Justice. The bounties which God provides are given to all, so they need to be rightly distributed among all living beings and everyone should benefit from them. The third meaning implied in the notion of Justice is that everyone is given a certain budget or a certain credit at one’s birth. As everyone is credited by the Invisible World, society should also provide all necessary conditions for one’s personal development and growth. When this is applied in practice, the Law of Justice is observed. What is the true meaning of Virtue? Love, Wisdom, Truth, Justice, and Virtue, these are all virtues. The word “virtue” is used in both: a broad and narrow sense. In its broad meaning it includes all virtues, moral qualities, and perfections. In the narrow sense virtue means good actions or doing good, and in an even more specific sense it implies a service to God. The numbers 1, 2, 3, 4, and 5, which are also inscribed inside the Pentagram, are numbers of the virtues. Then, there are three Cyrillic letters: В, У, Ж inscribed inside the circle around the Pentagram. They stay for: Великото Училище на Живота (Velikoto Uchilishte na Zhivota) meaning “The Great School of Life.” The Pentagram in fact depicts the Great School of Life in which we are enrolled to study. In the School of Life, we learn from our experiences. Everything that we encounter serves for our learning, advancement, and the development of our qualities, gifts, and virtues. Through this experience, we develop our mind, heart, and will. We learn and receive something from every person we meet because we are all interconnected in Oneness, though every human being is a specific and unique manifestation of God. By communicating with others, we come into contact with the Divine that is at work within each person.We learn not only from our contact with people, but also from our contact with all that exists: flowers, trees, stars, and mountains. Everything that surrounds us has a specific influence and teaches us, developing new aspects of our being. The obstacles and difficulties we encounter in life strengthen our will, make us think rationally and ingeniously in order to find out a way to remove them and go ahead. This is the meaning of the words Velikoto Uchilishte na Zhivota [The Great School of Life]. The Cyrillic letter “В” in the Pentagram can also stand for a Spiritual Leader, “У” for a Teacher and Savior, in other words: the spiritual Leader, Savior, and Teacher of Life. This is Christ who is the Leader of the Universal Brotherhood of Light. For all those who are willing to serve God, the first guideline and rule is written in the surrounding circle of the Pentagram: V izpalnenieto Volyata na Boga e silata na choveshkata dusha [In the fulfillment of the Will of God lies the power of the human soul]. These are extremely powerful words, and if we pronounce them with great concentration and faith, we can experience their extremely uplifting influence. As mentioned before, the circle as a form of sacred geometry presents the favorable conditions in which one is placed when advancing on the Way to Perfection. Human life, as it is described in the Pentagram, is surrounded by this circle. This indicates that with spiritual progress one will have favorable conditions and Providence, the Advanced Beings, and God Himself are going to protect and support that person. Throughout life such a person will always feel the guidance and support of the Invisible World. The Pentagram, as it is given by the Master Beinsa Duno, consists of three parts: the outer circle, the inner part, and the center which, taken together, represent the path of the human soul to perfection. These parts and the meaning of their components will be explained in detail below. THE OUTER CIRCLE OF THE PENTAGRAM The outer circle, in which the Pentagram is placed, represents the world or the School of Life on Earth. When one is still a young soul incarnating to gain some experience in life from now on, this one walks the outer path of the Pentagram. The symbols of the outer circle of initiation—a sword., cup, book, candle, and scepter—are outside the five pointed star. It means that one walks this path before becoming a spiritual student, while still living “in the world.” First Picture—The Sword At the beginning of one’s development one starts with exercising the primitive and egotistic force, making use of it, either rightly or wrongly, and this is symbolized by the sword.The sword presents the path of violence and aggression, the primitive and egotistic force, which serves only the individual or a small group of people, but not all people.A young and inexperienced soul uses this force without thinking about the consequences. The individual has not yet learned the Law of Karma—the Law of Cause and Effect. Second Picture—The Cup However, those who use violence in the world will learn their lesson, sooner or later. It is a Law: Violence begets violence. The so called “bitter cup” symbolizes the suffering that results from causing sufferings to others. The suffering is a method through which the human soul is awakened. Through suffering, one begins to understand that oppression and injustice are better not to be used. It is through suffering that one learns. Perhaps one does not always see the connection between the caused violence and the suffering which follows as a consequence. After passing away, one will clearly see this connection and will probably make a decision to come again to Earth and lead a better, more meaningful life. In this way, one can avoid suffering. Suffering also has another meaning. There is an esoteric Law, according to which suffering can be transformed into Love. All suffering endured by humankind is a preparation for the new human beings to come—the bearers of Love. The Master Beinsa Duno gave the following comparison: when milk is churned, the result is butter. In this case, the butter symbolizes Love. Suffering is a temporary phenomenon in life. The time will come when suffering will disappear because that which is causing it will also disappear one day. Suffering has yet a third meaning: the New Ideas will come from the Sun. Human beings cannot perceive them if their bodies are not refined and prepared for the higher vibrations. This refinement and attunement comes by passing through suffering. There is another Law which states: Suffering always precedes the birth of a New Idea in this stage of the human development. It signifies that the third meaning of suffering represents the labor pains of bringing the new human ideas to life. In the future, when human beings become more refined, suffering will not be necessary any more. That is why Beinsa Duno calls suffering a “Whip in the raised Hand of God.” Third Picture—The Book Through suffering we begin to study the Book of Life so that we can learn the Laws of Life and observe them. However, at this stage of development, we are still at the beginning of our awakening and have only read the first lessons from the Book of Life. Probably one will sometimes feel the connection between the violence employed, and the suffering that comes afterward. And so, by learning in this manner, the person in the third stage of development acquires practical knowledge and becomes wiser. However, this is still the beginning of one’s spiritual awakening, by learning the first lessons given in the Book of Life. Forth Picture—The Candle By reading the Book of Life and studying the language of Nature, one is coming to enlightenment. The light source represents the human mind; this is someone who reasons, who thinks because to think right implies to emanate light. This person is already aware of where to go and what to do. In the Pentagram, this phase of one’s spiritual development is symbolized by the lit candle. It means that a new light has illuminated the human consciousness so that the person may become a lit candle or a light-bearer. Through this light, one begins to see the greatness and beauty of the Divine Plan which leads from darkness to Light, from slavery to Freedom, from imperfection to Perfection, from sinfulness to Purity, and from ignorance to Knowledge. Fifth Picture—The Scepter When one is enlightened from within, this one comes to a scepter symbolizing power. Two is the symbol of power: sword and scepter; but these are two different types of power—the mundane power that kills and takes away; and the spiritual power that gives and resurrects. These two types of power are mutually exclusive. The scepter also indicates attaining a certain level of self-control and mastery over some of the forces and Laws in Nature. While the sword should stay in a horizontal position, the scepter is kept in a vertical position, which symbolizes the striving of the human being toward God. In the Master’s words: “You need to become a king of yourself—a self-master.” The scepter indicates the attainment of a certain degree of self-control. The selfmasters can restrain and transform the manifestations of their lower nature: the self-masters have learned how to control it and rule it. The scepter also has another meaning. In this stage of development, one is learning how to interact with certain powers and forces in Nature and how to make use of them. After passing these five phases of development depicted on the first circle of the Pentagram, the individual completes the external studies in life, most often without a conscious recognition of this. After that, one undergoes, in one or another way, an inner crisis of discontentment and dissatisfaction with oneself. Through this discontent the individual begins to search for the deeper meaning of life. Whoever has gone through the sword, the cup, the Book, the candle, and the scepter has already stepped on the Path of the spiritual student. THE INNER PART OF THE PENTAGRAM After completing the outer circle of Life studies, one can enter the inner part of the Pentagram. So far, the external life has influenced the human being without the active involvement of the human consciousness, but from now on one becomes responsible for one’s evolution. It already means an enrolment in the Divine School. This person will become a spiritual student, in other words, he or she will begin to consciously work on attaining the Divine virtues characterizing perfection. An English writer said the following, “When I see that someone works upon oneself toward perfection, I am filled with reverence. I feel that I am beholding something great. All ephemeral works fade before it.” In the inner circle of the Pentagram, there are again five steps in the development of one’s inner life. Each step is illustrated by a symbol. In the graphic black and white Pentagram, the symbols of the second circle are inscribed in the pentacle itself, whereas in the color Pentagram, which was given later, they are next to the tips of the Rays. The names of the five Divine Principles and virtues are inscribed into each Ray of the Pentagram. First Picture—A Staircase with Broad Steps Leading to a Door When the individual has succeeded to kindle the light of mind and to attain the scepter of wisdom, the first cycle of develop-ment—the worldly one—comes to an end and the second cycle of development—the spiritual one—the Path of the Disciple starts. This marks the beginning of the spiritual trials and exams. At first, the trials are easier so that the student can pass the exams; this is symbolized by a staircase with comfortable steps. The process is illustrated by the tip of Virtue, at the beginning of the Blue Ray of Truth, which leads upward to attaining freedom. The spiritual exams are of various types, similar to those encountered in daily life. Three examples are given below to illustrate this. When you have any kind of problem—big or small ones, or when you encounter obstacles and adversities on your life path and you do not take up to face them, but lose your courage, inner peace, composure, contentment, and joy of life becoming depressed and negative, you have failed your test. Another example for a test is your attitude when you lose something valuable. For example, you have performed scientific investigations for 20 years and have assembled them in a scientific work which is then lost. Without batting an eye, you should continue your daily routine as if nothing has happened. To retain your presence of mind and composure signifies that you have passed this exam. A third example for being tested is when you pass by a person in need, and you feel an impulse to give support, but you disregard it and continue on your way—then, you have failed the exam. During this stage of development, Truth begins to dawn in the human being. What is the significance of this? God is Truth; therefore, the dawning of Truth indicates the awakening of one’s Divine awareness. The spiritual student receives an impulse to follow God’s Path, to observe God’s Laws and to do God’s Will. This is only a glimpse of the dawning of Truth—the disciple will come to know Truth in its fullness only after embracing the ways of Love and Wisdom. Second Picture—The Teacher The second image in the middle circle of the Pentagram is that of a Teacher, whom the student meets. It is depicted at the beginning of the Green Ray of Justice. The Spirit of Christ begins to guide the disciple from within toward gradual inner changes. But this is just the beginning of the manifestation of the Christ Consciousness within the human being. In this phase of development, the spiritual student gradually enters the Path of Justice As mentioned before, Justice is respect and honor for everything that is alive in the world. On the other hand, Justice is the right distribution of the bounties provided by God among all living beings in the world. The third meaning of Justice is that every individual is given a certain credit at birth by the Invisible World. So, society needs to give to all its members according to their needs: each should be given the necessary conditions and rights for their proper development and well being. If this is followed, then the Law of Justice is observed in this society or nation. At this stage of development, the disciple is learning to live according to the Law of Justice. In the near future, one will make the first steps in this direction, and will gradually come to know the depth and the true meaning of Justice as a part of the one’s progress. Third Picture—The Steep, Stony Path Leading to a Narrow Door In this phase of development, the spiritual student begins to encounter more difficult and serious trials. This is indicated in the Pentagram by the steep and stony pathway, and the narrow door at the end. The steep path to the narrow door means renunciation or rejection of those worldly things which presented temptations for the disciple before that stage. After passing the path of renunciation, the student takes the Path of Love. Here the words of Christ are valid: “Strive to enter through the narrow gate, for many, I say to you, will seek to enter and will not be able.”29 Here are a few examples of those more difficult tests to be taken: One important task for the disciple is to have Love for one’s adversary. When someone has caused you harm intentionally, you should not become embittered and offended, but you should forgive that person and begin to love and bless him or her. The Master said that Love for your enemy is one of the most difficult tasks to be solved in life. There is a Law which states: True forgiveness exists when you apply Love toward the person you forgive. As the Master put it: Who is great? Those who have Love for God. Another example for a difficult test is the thirst for power, fame, and wealth. If someone, in striving to acquire them, becomes unfaithful to one’s belief system and relationship with God, this one has failed the spiritual test at that level. A third example is when a great misfortune befalls you such as a serious illness or another hardship. In such case, do not lose faith and become discouraged, but rather preserve your peace and joy, strengthening your faith and prayers and believing that everything is for good and will be transformed into good. This is the trial of Job. Every spiritual student will inevitably face the trial of Job on the path of ascension. This is a required test for someone to receive initiation. The trial of Job is the greatest one in this phase of spiritual development. One of the Master’s followers asked him, “Is not our suffering similar to the trial of Job?” The Master replied, “No, your suffering is only that of an actor who is playing a role on the stage.” In the ancient esoteric schools, the disciples were required to pass through various trials purposely created by their Teachers. Today, when life is so complicated and many-faceted, there is not really a need of artificially created trials—life itself presents them to all. After passing through the trials, the disciple has been purified and prepared to embrace Love. Immersed in Love, the spiritual student comprehends that all past life was a preparation for entering the True Life of Love. Forth Picture—The Eye When Divine Love has been developed to a certain extent in the spiritual student, it brings Wisdom. The Eye symbolizes Wisdom. It is the Divine Eye, the place of the Divine Spirit, “...that will teach you how to understand the Divine Truths.” This is the symbol of the inner knowledge given only to the people of Love because they will not abuse it or misuse it. The disciple now has a deeper understanding of things—a more profound outlook on life, and has received Divine Wisdom within. In the outer circle, one receives only superficial knowledge, but in the inner circle one enters the Realm of Divine Wisdom, depicted by the Yellow Ray. The portals to the Temple of Wisdom are open to the people of Love. These gates open only to those whom the keys of Higher Knowledge—the Knowledge of the Great Divine Science can be entrusted. Why? It is because they will not misuse this Knowledge for personal purposes, but will use it to serve God and others. If this Knowledge is entrusted to someone who has not passed through Love, that person could misuse this sacred knowledge and bring great misfortune not only upon oneself, but upon all others. Fifth Picture—The Tree of Life When Love and Wisdom are attained, the Tree of Life begins to blossom. The life of the spiritual student is bearing fruit—virtue is manifested in the mystical sense of the word. In other words, the individual comes to the realization of the purpose of life—to the understanding that the meaning of life is in service to God and others, by accomplishing good deeds. Virtue is inscribed in the Orange Ray of the Pentagram as the fifth quality which the disciple develops after Love, Justice, Truth, and Wisdom. The greatest good that one can achieve is to serve God. Therefore, at this stage of life, the disciple is already enlightened and comes to know that the only thing which can give meaning to life is the fulfillment of God’s Will in service to the Lord. The Master says, “To act according to Love is already serving God. When you manifest Love, you serve God.” The highest form of such service is to show others the way to God, to assist in the awakening of their consciousness so that they may come to know God and begin to do the inner work by themselves. After passing through the five Rays of the Pentagram and deeply instilling those virtues in their hearts, the spiritual students perceive the words of the Master given at the end of The Testament of the Color Rays of Light: “Love the perfect way of Truth and Life. “Make Good the foundation of your home, Justice your measure, Love an adornment, Wisdom your shield, and Truth your light. “Only then will you come to know Me, and I shall reveal Myself to you.” The second circle of development—the Path of Dawn, ends with this. THE CENTER OF THE PENTAGRAM After passing through both the outer and inner circle of the Pentagram, the disciple enters the center, called also Sanctuary of the Pentagram. This is the starting point of the Path toward Perfection, Eternal Life, and Immortality. This is the starting point of the Path passing through total surrender and resulting in complete devotion to God’s Work and service to humankind. In this phase of development, the disciple takes the most difficult and extreme tests. Here is the Divine Center where one merges with God, yet that one still maintains one’s identity and uniqueness in the process of integration in which the human soul becomes one with God. In the center of the Pentagram we see two snakes as well as a straight line, a circle, a cross, and a half-circle. The two snakes show that human beings are struggling with their lower nature, which needs to be transformed, and the ego-based life should be replaced by Love and sacrifice. Here the spiritual student undergoes the greatest sufferings and goes through the most difficult test—the trial of Golgotha. When the higher nature is victorious in the human being, such person defeats the dark side within oneself and passes through the cross. The cross implies full self-renunciation. As a result, the human being becomes one with the Divine and completes one’s development. On this path to Perfection and Divinity, the disciples, as mentioned before, pass through the greatest suffering. They are left all alone; as if nobody takes care of them and they feel totally abandoned. It feels like everything has gone wrong and their aspirations and intents have vanished: all their hopes now seem to be in vain as if everything was lost. Great is the darkness around them; they pass through a dark tunnel. At this moment, they might feel very lonely, but in fact, many Light Beings are watching over them. They are anxious for them not to fail the most arduous of all tests. If, at that moment, they become discouraged and desperate, they have failed the test. But if, at this crowning moment, they realize that, in spite of the separation they are experiencing now, there is One Who has always loved them and Who is always with them, even now, and that is God—then they have passed the trial. At this moment they realize that one’s only support is God. If they achieve this revelation, they enter into the New Life of bliss, joy, light, and freedom. They become Immortal and finish the human phase of their evolution. This is the trial that leads to Ascension. All these trials, through which the disciples pass, enhance their progress, that is why they are needed. Through them they develop and improve their mind and heart, and strengthen their will power. On the other hand, these trials, which are accomplished through suffering, purify and transform the human lower nature and dark side. All worldly thoughts, feelings, and impulses burn in the fire of suffering through which they pass. These lower ego-based manifestations were obstacles to the fulfillment of the Divine. Now the Divine, the Higher Nature of the human being can be revealed and when the human soul becomes one with the Divine, it fully completes its development. The Eternal Day has come at the end. That is why we say that the Pentagram shows the Path of evolution of the human soul or the Great School of Life through which one needs to pass in order to become perfect. When the awakened souls have progressed in the Great School of Life and have passed through all trials, which are presented in the Pentagram, the affirmation: “In the fulfillment of the Will of God lies the power of the human soul,” becomes their guiding star. This is the final goal, the end result of the entire path of spiritual development, which has been traveled. This is the wisdom that was attained from the entire life journey. This is in fact, the final result, and the crowning achievement of the human evolution. Note: This chapter is a compilation of excerpts from references (15-20).